Life is full of comings and goings, helloes and goodbyes, meetings and partings. 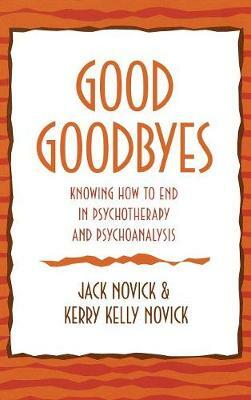 Good Goodbyes highlights the crucial importance of how the end of therapy is structured and experienced. Bad endings can destroy good therapies. Good endings can consolidate the work accomplished, transform relationships, and foster growth in both patient and therapist. With generously supplied illustrative clinical vignettes, Kerry Kelly and Jack Novick have assembled a most valuable presentation concerning treatment termination. They demonstrate how the prospect of termination shapes the work of the entire collaboration, from its very onset through and beyond the final day that patient and analyst meet. Their detailed exposition, organized along the lines of a reader's expectable questions, throws clarifying light on an aspect of the treatment enterprise hitherto accorded but meager attention. -- Stephen K. Firestein, M.D.